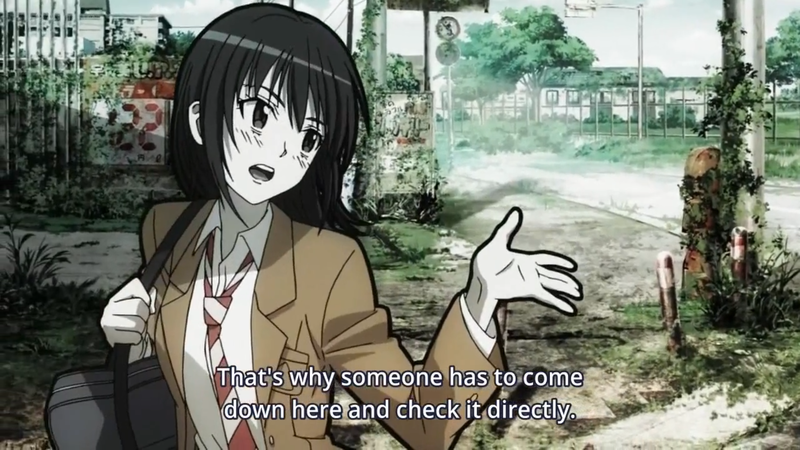 Coppelion was an Anime that I was really worried about after reading the Synopsis, as the setting itself was quite interesting, but with three Highschool Girls going to a highly radioactive town, I was expecting something rather lighthearted, as it probably would have been better to pull off. Now that it has started though, this worry flew away for me and I am pretty content with what I just witnessed. The show already in episode one shows that it won’t be all light-hearted and the characters seemed realistic enough for me to care about them in episode 1 already. The pacing for this intro was perfectly done and while there’s already a heck load of questions piling up for me, I am confident that those are going to be answered in the course of the show. One thing that I didn’t like as much for this show, is that the characters much like in Attack on Titan have really thick outlines, which one only realizes as soon as we seem them from a closer point. That is easy to get used though and not really much of a problem. I am looking forward to seeing more of this as the concept seems interesting enough to follow this.